The eternal kingdom be mine by his protection. Columba was born in Ireland in 521, and early in life showed scholarly and clerical ability. He entered the monastic life, and almost immediately set forth on missionary travels. Even before ordination to the presbyterate in 551, he had founded monasteries at Derry and Durrow. Twelve years after his ordination, Columba and a dozen companions set out for northern Britain, where the Picts were still generally ignorant of Christianity. Columba was kindly received, allowed to preach, convert, and baptize. He was also given possession of the island of Iona, where, according to legend, his tiny boat had washed ashore. Here he founded the celebrated monastery which became the center for the conversion of the Picts. From Iona, also, his disciples went out to found other monasteries, which, in turn, became centers of missionary activity. I O God, who by the preaching of thy blessed servant Columba didst cause the light of the Gospel to shine in Scotland: Grant, we beseech thee, that, having his life and labors in remembrance, we may show forth our thankfulness to thee by following the example of his zeal and patience; through Jesus Christ our Lord, who liveth and reigneth with thee and the Holy Spirit, one God, for ever and ever. Amen. II O God, by the preaching of your blessed servant Columba you caused the light of the Gospel to shine in Scotland: Grant, we pray, that, having his life and labors in remembrance, we may show our thankfulness to you by following the example of his zeal and patience; through Jesus Christ our Lord, who lives and reigns with you and the Holy Spirit, one God, for ever and ever. Amen. New Hebrew reading: This reading was quoted just yesterday in Roland Allen’s Gospel reading. Persons attending commemorations on these two successive days will have heard it twice. Should it be changed? Is there no other New Testament reading that is appropriate? Bio: He needs a ‘Who he is’ and ‘Why he is important’ statement. And a ‘He died in 597.’ statement. Second paragraph: “Presbyterate”? “Priesthood” is a perfectly good English word. Third paragraph: The collect specifically says “Scotland,’ so why call it “northern Britain” here? I was Rector of Saint Columba Marathon and indeed there is a small window adjacent to the pulpit which depicts the Loch Ness monster. Thanks for advertisement, John. In the late 400’s, the kings of Dalriada moved their seat from Antrim (Ireland) to Argyll (Scotland). Columba anointed Aidan MacGabrain as the first Christian king of Dalriada in 574. The next year, Columba and Aidan attended the council at Druim Cetta in Ireland. The council affirmed the independent status of Scottish kingdom of Dalriada. At that or perhaps a later council on the same site, Columba’s eloquent defense of the Irish bards saved the order from suppression by overly-zealous Christian kings. The Picti – who may not even have been a Celtic people – lived on the eastern coast of modern Scotland. They were far from “generally ignorant of Christianity.” Many of them had been converted by St. Ninian (c. 360-432, September 16), as the Venerable Bede said and modern archaeology has confirmed. While one would like to attribute the warmth of Columba’s welcome to the innate nobility of the Scotti (i.e., the Irish), it probably has more to do with the fact that the both Scotti and the Picti were already familiar with Christians and knew them to pose no threat, at least not in small numbers. By the way, Picti (like many of the names by which we identify American Indian tribes) would appear to be an ethnic slur, as it means something like “the painted or tattooed people” in Latin. We have no idea what the Picts called themselves, or even if their various tribes recognized themselves as belonging to a single ethnic group. 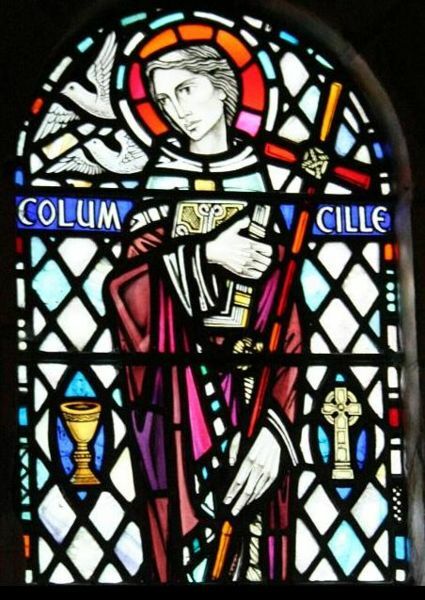 Which is a long way round to the point that while Columba’s ministry eventually extended into Pictish territory, he was primarily the apostle to the Irish Scots of Dalriada. Iona did many things, but there was no need for a link between the Christian Scotti on the two shores of the Irish Sea. The union of the Scots and Picts was accomplished much later and mostly by force of arms. Of the many churches and monasteries founded by Columba and the monks of Iona, none was more important that established by St. Aidan (died 651) at Lindisfarne. It was through Lindisfarne and her daughter monasteries that the evangelical zeal and intellectual passion of the Irish were transmitted to the English Church. I know there are those who object to including legendary material in these bios, but as there’s already a good bit in this one (St. Patrick’s prophecy, the landing on Iona with exactly twelve companions, Columba’s last words, and anything else that derives solely from Adamnan’s “biography”). Little of what’s in the write-up contributes much to understanding Columba’s impact on his and later times, so why leave out the good stuff? There’s not room for all of them, but surely we could work in a few: the curse of Longarad’s books, the copying of Finnian of Moville’s psalter, the groundbreaking lawsuit which followed (the first case of copyright infringement in European jurisprudence), Columba’s appeal in the traditional Irish form at Cul Drebene, and the resulting ecclesiastical and civil trials which led to the mission to Scotland and Columba’s pledge to win ten souls to Christ for every man killed at Cul Drebene. And most of all, the encounter with the Loch Ness monster. I’d like to believe that whoever picked the Gospel reading knew the story (“I give unto you power to tread on serpents” as the AV translates it), even if the editors of LFF lacked the courage to put it in the biographical sketch. Line 1, third paragraph: add “Gartan (in modern Donegal)” after “in”.